Meet Duke, the Downey Police Department Canine Unit. Duke and his partner, Officer Chris Kurtz, demonstrated Duke's abilities at the Dog Party in the Park last Saturday. 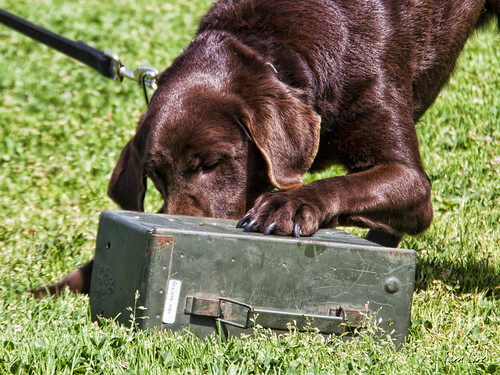 Duke quickly passed by the decoy containers and zeroed right in on the container with the contraband. He scratches on the surface to indicate that he's found something. Duke is a 2-year-old chocolate Labrador Retriever. He joined the department and started training last August, and was certified (along with his trainer) as a narcotics dog in September. In his short career, he has already uncovered several million dollars worth of drugs for the Downey Police. For Duke, it's just walk in the park. 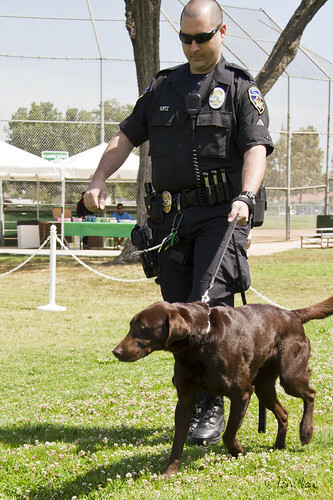 See Downey police adds canine to force for more information about Duke, from the Downey Patriot.